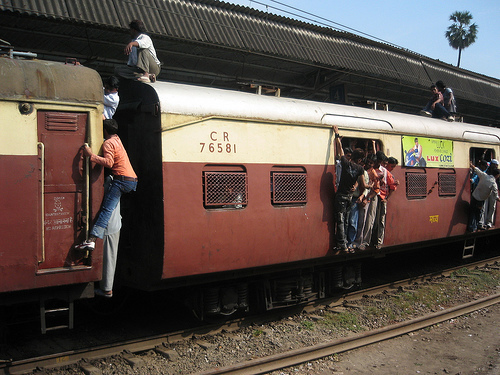 Around 4,000 people per year die on Mumbai's rail system. A new $430 million World Bank grant will help Mumbai's suburban train relieve overcrowding and improve operational efficiency. Photo via stefanx80. India’s Hindustan Times reported today that the World Bank has approved a $430 million project to help finance improvements in Mumbai’s suburban rail system, which carries nearly 7 million commuters daily. The Mumbai Urban Transport Project-2A (MUTP-II), approved yesterday, aims to “improve the passenger carrying capacity, operational efficiency, level of comfort of, and the institutional capacity of” the suburban rail system, according to the World Bank website. Funding as many as 720 new rail cars, this should translate into less overcrowding and faster transit times for commuters. Under MUTP-II, fifth and sixth railway lines will also be laid between the suburban Kurla station and the Chhatrapati Shivaji Terminus. Hopefully, the project will make the system safer. Presently, more than 4,100 people ride on trains built for 1,750 (this number is down from 4,500 as a result of the first phase of the Mumbai Urban Transport Project). And approximately 4,000 people die each year on the rail system, often electrocuted by cables as they ride on top of the trains, or killed as they lean out of the cars for air. The project should also improve the system’s energy efficiency by completing the conversion from 1,500 V DC to 25 KV AC traction on the remaining sections of Central Railway in the Mumbai Metropolitan Region. Still, to truly improve transit conditions in Mumbai, this project needs to be just part of a larger sustainable transport campaign in this mega-city of 17.7 million, where 11 million people daily still rely on public mass transport. As we suggested in a previous post, this effort should include upgrading the BEST buses by enlarging the fleet of compressed natural gas (CNG) buses and adding basic amenities like air-conditioning. And to improve sustainable accessibility, it is also urgent that MMRDA prioritize pedestrian and cyclist infrastructure; after all, walking and cycling still account for one-third of all daily trips in the city, and we don’t want that number to go down. 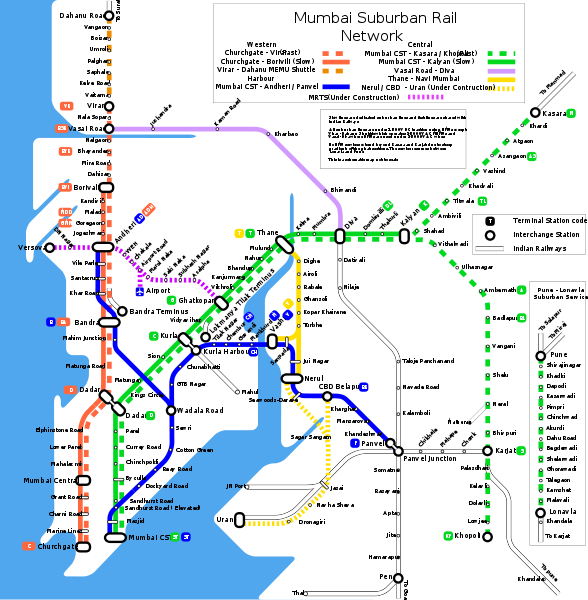 Mumbai's suburban rail map. Image via Wikipedia.